This 781 Anthem model has a bronze titanium handle and a satin finished blade made from premium CPM-20CV stainless steel. The 781 Anthem represents Benchmade's first ever single piece titanium AXIS lock knife. This integral titanium handle offers a rock solid feel in hand with a cheveron patterned texture for improved grip performance. Premium CPM-20CV stainless steel provides an ultra-tough blade for maximized edge retention. It's outfitted with a tip-up titanium pocket clip that is reversible for left or right-hand carry. Cue up an everyday carry hit with the Benchmade Anthem. Integral handle design constructed from a single piece billet titanium for unprecedented handle strength. Dual thumb studs, reversible pocket clip, and an AXIS® lock mechanism offer fully ambidextrous operation. CPM-20CV blade steel provides strength, edge retention, and corrosion resistance. You can feel the ball bearing system as you flip the blade. 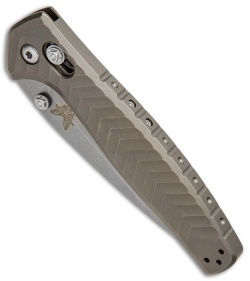 The thumb studs and axis stud are detailed unlike any other benchmade. The factory blade isn’t razor sharp but it has a working edge...I cut myself closing the blade (it happens). This is by far the nicest knife I’ve ever owned. I went through amazon because BladeHQ only had the serrated one a couple weeks ago. People say the sebenza is nicer but it’s not as unique as the anthem. If you like your 940(-1/-2) then you’ll love this. You can’t go wrong with benchmade! I discovered this knife in a review of a different knife. As soon as I saw this integral frame I knew I had to have it. The knife does not disappoint at all. It opens and closes so effortlessly. Choose between thumbstud, flick, or even gravity alone to open and close the knife. The carved clip look great too. The only minor improvement I can think of would be to make the clip grip a little tighter. It could be removed and bent just a tad, but hopefully it will be fine the way it is. 1) the blade was off center. 2) uneven grind of the edge. 3) the guide bar for the spring was off center. Resulting the unsmooth action of the Axis-lock bar. 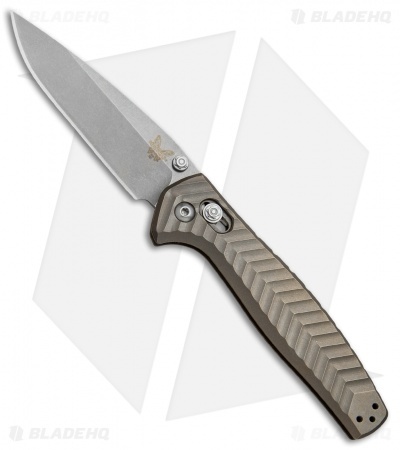 That was acceptable for a $150 knife, but not for a $425 knife. For overseas customer like me, it is not recommended as we cannot enjoy the superb customer service offered by Benchamde. Ok, yea, the price hurts, but after months of commiseration over this knife, I pulled the trigger on this absolute gem. I bought a second batch one, with a more gunmetal or pewter colored anodization and a closer matched clip. I have to say, the fit and finish on this thing is the best I've seen out of Benchmade post-Quality Control Crisis. The primary grind is perfectly symmetrical, and the secondary bevel is exactly even. The centering is laser-straight and the action is basically zero gravity. One thing to note is that the axis lock, by nature of the integral construction of the knife, is running on a rod and coil spring rather than the usual omega springs, making it much stronger and even smoother. 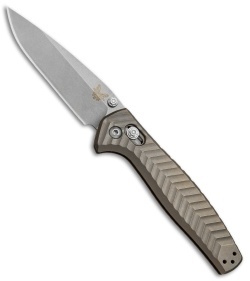 This is every bit as sharp as my CRK Inkosi and maybe even sharper, it's crazy. It's either tied with or is the sharpest knife I've ever owned. One thing I'm not enamored with is the clip design, especially the fact that it's supposed to hover over the side of the handle. I understand that's for the function of the piece but it really bothers me. 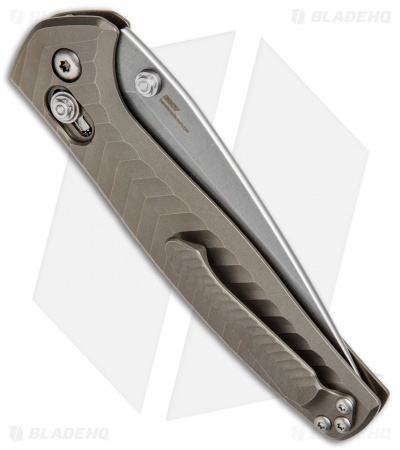 On the other hand it functions without hesitation in its current state, however annoying, which is a rarity in the world of milled Ti clips. Overall, I love this knife and have been finding it difficult to carry anything else since I bought it. Such a smooth knife! My blade came centered and has a pretty even grind. Great high quality materials backed by a great warranty. Can't go wrong with this knife! I've had this knife a week and can't put it down. Soo smooth, compact and reeks of class. Fit and finish are excellent. Blade is so sharp I've cut myself twice without immediately knowing. 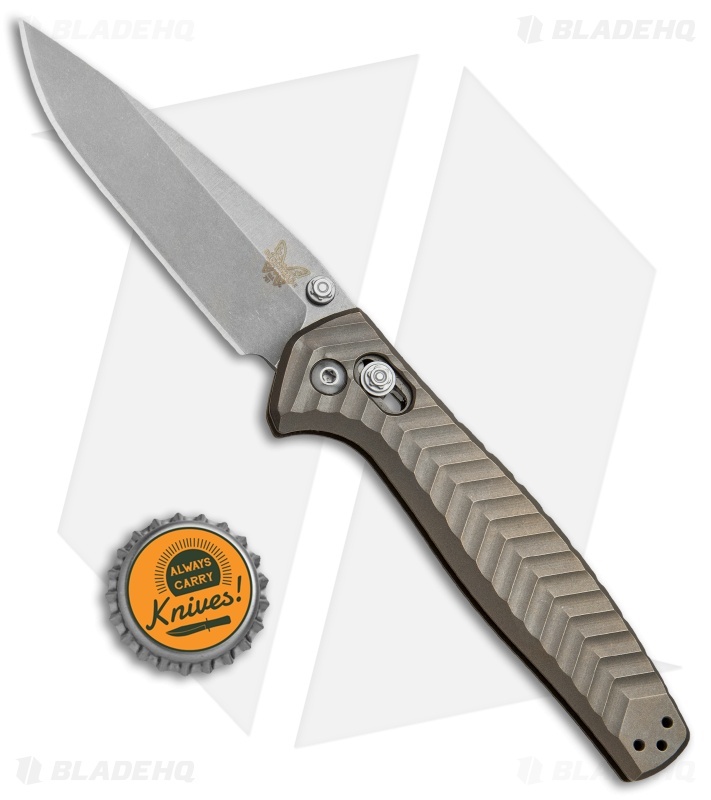 I get the push-back on the price, but this is one knife that lives up to the worth. I do have one issue and the blade isn't centered. I should have knocked off some stars on quality since final inspectors should have caught this error, it's that obvious. Overall though, this is really a fantastic piece of usable art.